No sooner than Congress President Rahul Gandhi anointed his sister Priyanka with the coveted position of All India Congress Committee (AICC) general secretary, it evoked as much commotion among the Bhartiya Janata Party (BJP) leadership as the visible euphoria in the Congress rank and file. The sharp reactions of top BJP leaders made it loud and clear that Rahul Gandhi had not just taken them by surprise. They looked clearly jolted, obviously, because they had not imagined A mother of two, Priyanka Gandhi, 47, taking the final plunge into full-time politics, that will determine the political destiny of prime minister Narendra Modi. Despite mounting pressure of investigation agencies on her husband Robert Vadra, she step aside fear and assumed the leadership role in the troubled times, both at home and the party. By running a well-orchestrated campaign to ridicule Rahul as ‘pappu’, the BJP leadership seemed convinced that they had managed to contain the most vocal voice against them. It was rather late in the day that they realised that their ‘pappu’ harp had eventually helped Rahul to evolve as a far more matured , confident and vociferous president of the country’s oldest political party that alone has the potential to meet the might of the ruling BJP at the national level. The manner in which even prime minister Modi reacted to the development and made oblique attacks on the “dynastic” traditions of the Congress, made it evident that the panic in the BJP ranks was a bit too disproportionate to the impact that Priyanka was likely to make. With barely 100 days left for the final battle of the ballot, Priyanka may not be able to do any magic. “The move is going to be the game changer in the next three months,” felt Rajasthan Chief Minister Sachin Pilot over much anticipated move. 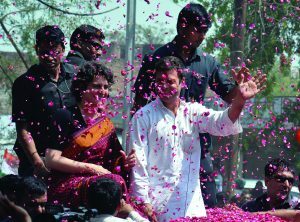 The jubilations in the oldest political party is reflective of their growing expectations of galvanizing support of a large number of youths to the party fold after powerfully planned roadshows of Priyanka in UP. The elections to the Lok Sabha are due in April-May this year. Yet, there could be no denying that her presence on the ground would make all the difference to the Congress cadres which have been lying dormant ever since it’s most active and hands-on state chief Rita Bahuguna Joshi was replaced by Nirmal Khattri. Provoked by the move, Bahuguna switched to BJP where she is an important minister in the Yogi Adityanath cabinet. The subsequent installation of cine actor Raj Babbar did help to play some gimmick but failed to rejuvenate the party. Crisis of leadership seemed to be the biggest challenge for the party leadership that was aware of the prevalent infighting between some of the prominent faces in the state. What the party needed desperately was a leader of stature that could not be questioned and a face that could be taller than the rest. Sure enough, none other than Priyanka could have foot that bill. After all, the foremost requirement of a political outfit going to poll is its undisputed leadership. Moreover, Priyanka clearly has it all — a high profile, excellent communication skills, a prompt connect with crowds and above all the charisma, that was quite pointedly reminiscent of her charismatic grandmother Indira Gandhi. Priyanka is all set to assume the new position in the first week of February after which she is expected to out the party on the fast track. How her presence actually plays out on ground, only time will tell. However, the fact of the matter is that now the message is loud and clear, that Congress going to be contender in the game and actively compete in upcoming Lok Sabha elections on the front foot. Such a message would go a long way in tapping the party’s traditional vote bank of Upper caste Hindus, Muslims and Dalits. 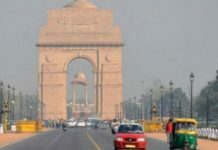 Even though Congress party has been down in the dumps for years, the recent victory of the party in three states of the Hindi heartland has made it predominantly evident that it is now on the revival path. The ripple effect of the victory in Chhattisgarh, Madhya Pradesh and Rajasthan is bound to be felt in UP which is at the core of the Hindi heartland. The prevailing disillusionment of upper caste Brahmins with the BJP could come in handy for the Congress, which would also be preferred by a large section of Muslims who would prefer the Congress to BSP. Politically unpredictable Mayawati’s past alignments with the BJP continues to haunt in the minds of Muslims who still look at her with suspicion. Further, the manner in which Mayawati has been blasting Congress is likely to be even more putting off for such Muslims. On the other hand, Akhilesh Yadav has been quite discreet in maintaining silence about the Congress. It is also being speculated that there could be an unwritten understanding between Akhilesh Yadav and Rahul Gandhi to avoid the division of the crucial Muslim vote, which is bound to come the Congress way too now that it is seen as a player on ground. No doubt that would really be a tight ropewalk for both Rahul and Akhilesh but perhaps it would be inevitable to strike a deal somewhere because any division of the Muslim vote could benefit the BJP. A good chunk of the upper caste Brahmin vote could also fall in the Congress lap for the simple reason that there is much disillusionment among them with the BJP. Moreover, it is widely believed that Brahmins would avoid going with SP or BSP. 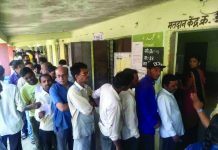 Bearing in mind, the recent trends that became visible in the states of Madhya Pradesh, Rajasthan and Chhattisgarh, where Congress did manage to get a section of the Dalit vote, it would be a predetermined conclusion that a similar trend would follow in Uttar Pradesh. Evidently, therefore, it would not be far-fetched to assume that Priyanka’s target would be to bring back to the Congress, its traditional vote. 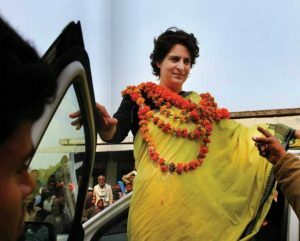 Much speculation was also being made on the million dollar question — whether Priyanka would contest herself or not; and whether she would replace her mother Sonia in Raebareli or take on prime minister Narendra Modi in Varanasi? For obvious reasons, the BJP leadership would want the narrative to be written as Modi versus Priyanka for the simple reason – she could be kept engaged for most of the time in just Varanasi. But one thing is for sure that she would not like to get bogged down with any single place as that would hamper her presence in the 40 East UP constituencies which have been specifically entrusted to her. Interestingly, some senior BJP leaders have been trying to undermine Priyanka by asking why she has been reduced to leader of just half of UP. Well, time is running out. With less than 100 days left for the final battle, it was quite pragmatic on the part of Rahul Gandhi to have made his sister is in-charge of just half the state. It will be no mean task for anyone to reach out to each of the 40 constituencies within the limited span of three months. While the Congress cadres might have just woken up from their long slumber, what is needed now is immense legwork. The local leaders too have got rusted in the absence of activity. Priyanka would be required to ensure oiling of the entire machinery and to make it operational. Unless local leaders fan out in their designated areas and reach out to the target constituents the revival effort may go in vain. After all the Congress has a mountain to climb and Priyanka is going to be not only head of the expedition but is also expected to be the Sherpa. With the larger task of running across the length and breadth of the country naturally becoming Rahul’s priority and responsibility, his sister would be carrying the overall responsibility of UP on her shoulders. Right from taking the call on candidates, allocation of constituencies to star campaigners and ultimately lead the campaign, it would be Priyanka all the way. 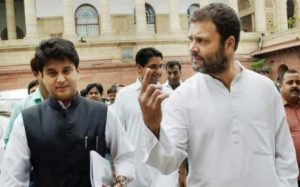 Jyotiraditya Scindia might have given a parallel position as general secretary in-charge of West UP but he surely does not enjoy the clout of Priyanka. In any case, he is new to the politics of UP. But his proximity to Rahul Gandhi may help him to hold sway over various factions of the party in the state. Thus, local ‘satraps’ will easily sink their personal differences and rise to the occasion in the larger interest of the party’s mission to take on the challenges from Modi-Shah duo. UP Congress chief Raj Babbar may not have been instrumental so far in giving the party any new impulse. But with Priyanka now at the helm of affairs, much awaited organisational restructuring could soon be there after she assumes her charge in first week of February. 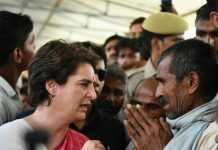 Political observers are keenly watching how Priyanka is going to utilise constructively heavyweight leaders of the UP Congress like Pramod Tiwari, who had never lost a single election, remains terribly under-utilised so far. Likewise, the younger leaders like Jitin Prasad, R.P.N Singh, Pradeep Mathur, CLP leader Ajay Kumar Lallu, Ajay Rai, Aradhana Misra, Aditi Singh and a few others could also come in handy in the campaign. Some other veteran Congress leaders, who were lost in oblivion, could also be tapped for their potential to rekindle the party in their respective areas. Ever since Priyanka’s name has come to the forefront, BJP leaders have been questioning her credentials as any “game-changer”. Already, they have begun to train their guns against her husband and his alleged involvement in several shady deals. Here again, obvious counterpoint to be raised would be – why BJP had not been able to pin him down if the charges against him were really that grave and substantial? 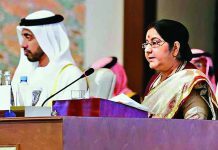 What BJP had further begun to use as another arsenal against her is their contention that she had failed to prove herself even in Amethi and Raebareli, the parliamentary constituencies of her brother and mother. They are busy citing the defeat of the Congress party in eight of the ten assembly segments of Amethi and Raebareli Lok Sabha constituencies at the 2017 state elections. What they seem to overlook is that there is a subtle difference between Priyanka then and now. Then it was a family member coming on a short trip to win the voter .Today when she assumes a full-time role in the party, she would be taken more seriously. In any case, the more that the BJP questions Priyanka’s leadership, the more she would gain in stature as well as in popularity. At the end of the day, BJP’s anti-Priyanka tirade alone would herald her rise in politics.